If you search for “slider” in the WordPress plugins directory, MetaSlider is the first result that comes up. The plugin, created by the team at UpdraftPlus, is active on more than 900,000 sites, more than any other free slider plugin, and averages a 4.7-star review. It includes four different types of sliders: Flex 2, Nivo Slider, Responsive Slides, and Coin Slider. An update released today introduces Gutenberg support with a block for inserting sliders. Users can access their sliders via the block insertion tool. Clicking on the MetaSlider block allows users to select from among the sliders that they have already created in the admin. After the user selects a slider, a preview will appear instantly in the Gutenberg editor. Previously, the process of inserting a slider into content involved copying and pasting a shortcode. Joe Miles, director of Business Strategy at UpdraftPlus, said the team sees the Gutenberg editor as a major improvement especially for those who are new to WordPress. Miles said the company is currently working on adding the ability for users to create and edit sliders within Gutenberg and hope to include it in the plugin before WordPress 5.0 lands. The UpdraftPlus team includes 13 developers who are devoted to the company’s WP-Optimize and MetaSlider products. Miles said adapting to Gutenberg was fairly simple relative to some of the other projects the team is working on. UpdraftPlus plans to continue to maintain and improve the shortcode-based slider insertion method, as demonstrated in the changelog. Users who opt to stick with the Classic Editor will still be able to keep their same workflow. Meanwhile, the product’s development team will be working on integrating all of the pro version’s front-end features with Gutenberg. 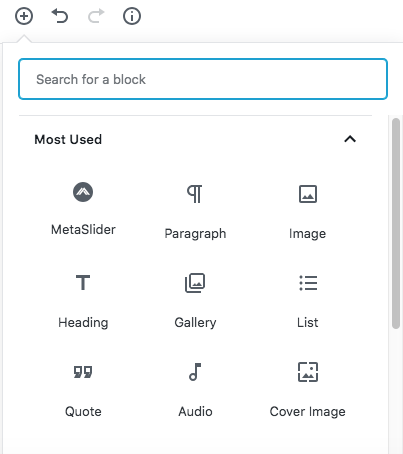 In addition to Gutenberg support, the team is also going to be adding the concept of themes to sliders so users can build a slider and change its theme in a couple of clicks. They plan to release free and commercial themes and all will be built to be compatible with Gutenberg. Smart Slider 3, MetaSlider’s next closest competitor with 300,000 installs, is also compatible with Gutenberg with a similar workflow for inserting sliders. Both slider plugins are not yet capable of providing the slider creation and editing process inside the Gutenberg interface but the capabilities should evolve as WordPress gets closer to the 5.0 release.